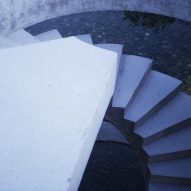 A spiral staircase made from cast concrete leads up to a turfed roof overlooking a pool and polo field at this stables near Buenos Aires, which was designed by local firm Estudio Ramos for a professional polo player. 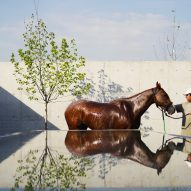 Estudio Ramos created the stables for polo star Nacho Figueras on the flatlands of La Pampa near General Rodríguez, a city within the Greater Buenos Aires area. The vast, open plains and the extensive vistas towards the distant horizon are reflected in what the architects described as the "pronounced horizontalism and simplicity of elements" employed in the design of the stables building. 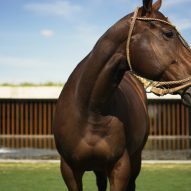 The Figueras Polo Stables provides stalls for 44 polo horses in a pair of low-lying elongated volumes that are positioned in parallel, with one opening onto the polo fields and the other looking towards the rear of the property. The arrangement of the two structures and various freestanding walls results in a composition of spaces with different characteristics suited to their programmatic functions. In addition to a row of stalls, the block facing the polo field accommodates the main social areas, including a lounge with trophies, saddles and other riding gear displayed on open shelving. The second block to the rear contains further stalls and facilities including the groom's quarters. A concrete roof planted with wild native grasses connects all of the spaces with a slope that descends toward the playing field. 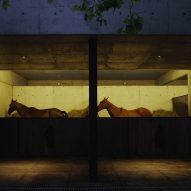 "The volumes that face the field are partially hidden behind extended walls and massive planted earth slopes," said the architects, "which not only provide privacy to the stables, but also subtly reduce the building's impact on the landscape." 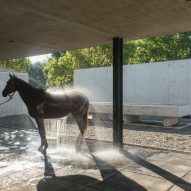 "Only the centre of the building is revealed, where a large water pond is located next to the covered exterior terraces and the tack room," they added. The roof is supported by simple I-beam columns and helps to shade various outdoor spaces, including a patio overlooking the reflecting pond and an adjacent walled garden. 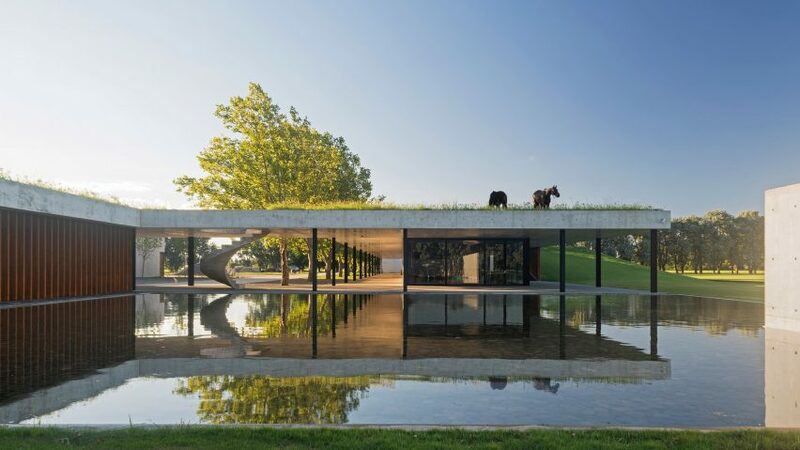 The grasses covering the building's roof were chosen to offer a more wild and natural contrast to the manicured turf of the nearby polo field. 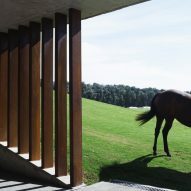 Slopes leading up onto the roof provide access for both people and horses, as well as functioning as seating areas for watching the polo matches. 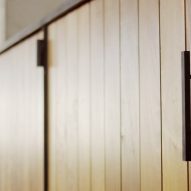 A simple palette of exposed concrete and local hardwoods is employed throughout the project, creating low maintenance structures with an aesthetic that will weather attractively over time. Pre-weathered steel is also used to create louvred screens lining the walkways around the stalls. 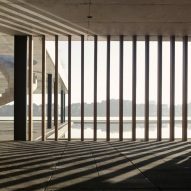 The slatted surfaces cast linear patterns of light and shadow across the floors of these spaces. The roof connecting the two parallel blocks of stalls is punctured by a circular opening, through which a freestanding cast-concrete staircase ascends in a spiral from the poolside patio. A video of the project produced by Estudio Ramos and Matias Lix Klett was presented at the Venice Architecture Biennale 2016 as part of a group exhibition called Time Space Existence, which included work by international architects from six continents. The firm, which is headed by Juan Ignacio Ramos, Ignacio Ramos and Soledad Ramos, applies modernist influences to residential and commercial projects such as a sailing clubhouse near Buenos Aires featuring an angular concrete volume stacked on top of a rectilinear base.